Isaac Levitan (1861-1900) was an outstanding Russian sketching painter and realistic painting master. At the same time, he was also the member of Peredvizhniki. The works of Levitan were very poetic, which deeply and truly showed the beauty of the characteristics of the Russian nature. The uniqueness of his sketches lied in the succinct strokes, comprehensive coverage, strong emotions, the depiction of the state of the nature and various changes of the spiritual experience and the rich brooding melancholy feeling. The famous painting Autumn Day Sokolniki was the first work of Levitan. This painting reproduced the dark golden autumn. 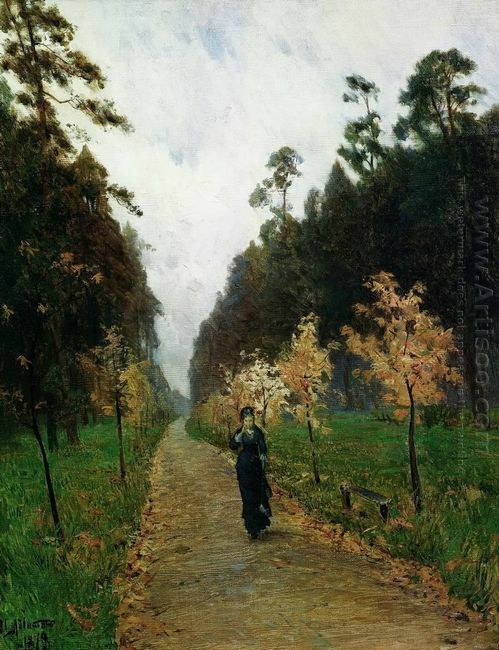 The autumn scenery was as bleak as the life in Russia and Levitan’s life. The painting seemed to emit something that was able to affect each person’s feeling of sadness. A black-clad young girl—it is was the strange woman standing on a heap of fallen leaves and walking in the path of Sokolniki. Her song was unforgettable for Levitan: “my song is full of lingering sentiments, but makes you miserable……” She was alone in the forest, and this kind of lonely feeling made her full of meditation and melancholy sense. Autumn Day Sokolniki was the only Isaac Levitan painting that depicted the character, which was also the one that Nicola Chekhov once had described. Since then, any character no longer appeared in his paintings, replaced by the forest, pasture, spring wind in the mist and Russia’s shabby huts. These houses were silent and desolate, just as the silent and lonely people. Kazimir Malevich once said, “The square plane marks the beginning of art Suprematism, which is a new color realism and an object creation…… The so-called Suprematism means the pure emotion or the supreme feeling in the painting.” After the denial of the painting’s subject, object, content, and space, simplification became the final performance. The consciousness of the people was shown in the close-zero content and the white science of the painting. 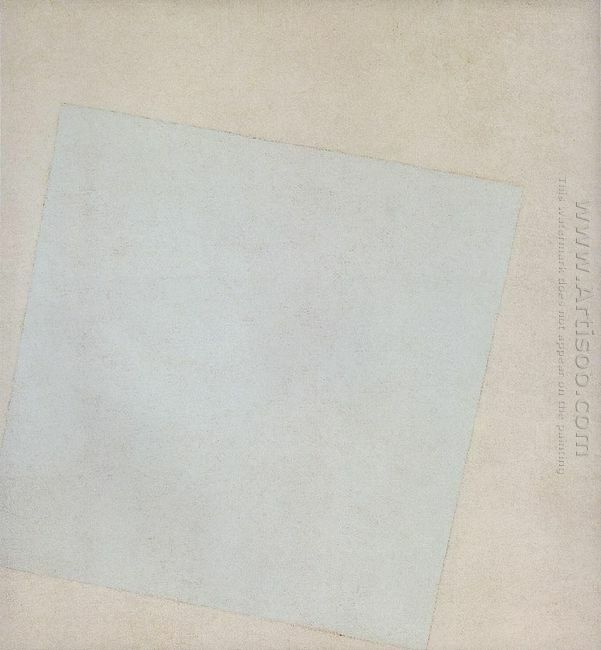 “Nothing” became the supreme painting principle of Suprematism. At the end of 1913, Malevich began to restrain his interest in the earth’s gravity and conquering the universe. He said in Maqiu book, “My new painting does not belong to the earth. The earth is like a ruined house and has been abandoned. Indeed, in the human body, in people’s consciousness, there is a desire for the space and a yearning get away from the earth.” In Malevich paintings, the theme about the universe and space flight began to be highlighted. Many of his works broke off the concepts of up and down although the forms were full of rhythm, as if to hover freedom in a vast imaginary space. The blue of the sky covered the space sight, so Malevich ripped the colorful awning. “I have broken the limit of blue color world,” he said with passion, “I turned to white, except for me, the pilot comrades, cruise in the infinite world. I have established the banner of Suprematism. The free white sea is lying in front of you.” When the space’s theme reached the peak, the white became the ultimate symbol. The portraits of Repin were very rich. The figures he painted with distinct personality were portrayed exquisitely. This depended on his outstanding realistic skills. 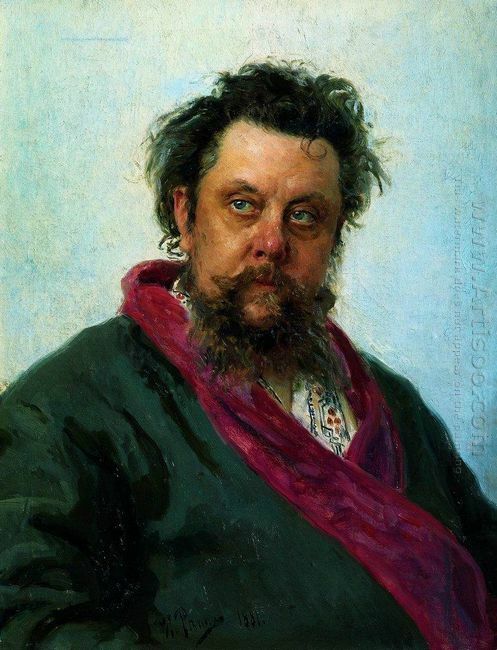 The painting Portrait Of The Composer Modest Musorgsky was one of the representative works of portraits.The painting depicted that when Musorgsky was ill in hospital, the resolute and tenacious spirit of this great composer was emphasized. The painter used the perspective of looking up to show this great musician, whose head and chest formed the angle of rotation, sharp eyes and resolute character to be showed in front of the audience. like an old man. The arrival of Repin made Musorgsky feel freshed and sit up from the bed. In the ward, Repin spent four days completing the portrait of Musorgsky. A few days later, Musorgsky died. The painting was purchased by Tretyakov (now preserved in the Tretyakov Gallery in Moscow). Repin devoted all the remuneration and built the monument in the tomb of Musorgsky. This famous oil painting, Zaporozhtsy was created by Ilya Repin in 1880 and completed in 1891, lasting for 12 years. 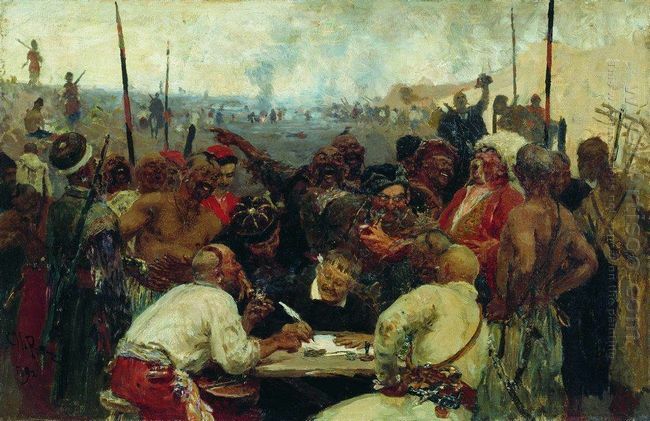 This work was based on the Ukraine folk legend: Turkey Sultan put forward a letter to require Zaporozhtsy to believe in Muslim and join with them to fight Russia. The brave Zaporozhtsy who loved freedom resolutely refused them and laughed at Sultan. These ordinary humans’ actions were revealed through the contempt for the enemy. For the creation of this history painting, Repin carefully read the history of Ukraine and understood the background of legend era. At the same time, he visited the areas closely related to this event in 1880 and got familiar with people’s clothes, faces, bodies, etc. In addition to creation of many sketches and drawings, he also made a lot of portrait clays. He made painstaking efforts and repeatedly drafted to constantly revise and supplement to his creations. Zaporozhtsy was a work consisting of lots of people. Ilya Repin made powerful features to the character’s attitudes, bending fingers, details of lines of clothes and hairstyles, and character’s psychological and emotional feelings. In his later years, Repin’s right hand was not flexible, so he used his left hand to paint. In order to repeatedly bate and modify the works, he always walked several miles back and forth every day. He loved his art career and worked very hard. Sometimes because of the excessive fatigue, he fainted in the studio. The doctor asked him to have a good rest in Sunday and get away from painting. So he had to draw sketches with cigarette butts to leach the ink with no painting tool. In the oil painting of Ivan the Terrible and His Son Ivan on November 16, this Ilya Repin painting chose such a plot to portray: when Ivan fought with his son, he threw the wat in his hand to his son. But the wat unfortunately hit the son’s head, and a lot of blood flew. This occasional violent impulse made the successor killed. Ivan immediately realized his terrible action and stepped forward to embrace the dying son. His eyes were full of terror, remorse and shame. He wanted to ask his son to forgive him, but it was in vain. Both animal and human nature were shown in Ivan. In order to enhance the Realism painting’s feeling of terror, the painter deliberately adopted the deep red tone and the dark background to strengthen the prospects of terror. The red carpet represented the bloody killing scene. The artist concentrated on portraying Ivan’s face and stared at the big eyes in a blue funk. The irreversible choice pain indicated that Ivan’s rule would be destroyed, but also showed the world why tyrannical Tsar was doomed to fail. 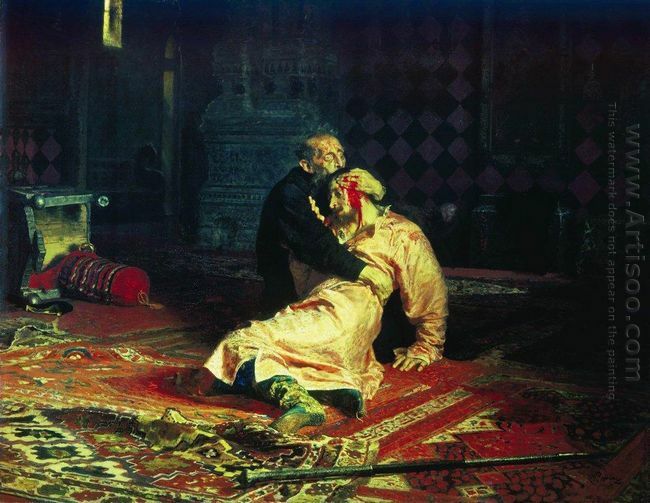 This painting, Ivan the Terrible and His Son Ivan on November 16, angered the tsar. An attorney wrote to the emperor in the memorial, “The painter used all the truth to describe this event. What does he want to do? Why he paint Ivan? In addition to a certain tendency, there is no other reason.” So the picture was removed once exhibited. Sacred and Profane Love was Titian’s early period work that depicted the beauty of female. This Renaissance painting was based on a story in Greek mythology about the meeting of Medea and Venus. To recapture the throne occupied by his uncle, Iason decided to capture the god’s holy things—golden fleece. Aphrodite, the god of love, made Arcas’s Princess Medea lose her heart to Iason at first sight. With the help of Medea, Iason and his friends overcame all difficulties and finally killed the guard dragon and got the Golden Fleece. Later, Medea and Iason got together. The young girl in Sacred and Profane Love with white and blue dress on the left side was Medea, she sat on a marble pool, and looked a little bit worried and scruples. She hugs a black magnetic tank that filled with dazzling pearl. While Aphrodite bared her plump figure and sat casually along the upper right side of the pool, which contrast to Medea’s reserve. Her blond hair blowing in the back of the head, and her left hand held a vial. In the middle of them, Small Cupid played the roses in the pool. The background of this Titian painting is a typical Italian countryside style, crossed the trees, the distant ancient castle, lakes and medieval tower-shaped church were visible before our eyes. It seemed that it was the setting sun that made the sky shrouded in the sunset glow. This painting means a lot. It was said that the love of heaven stands for Eros’s unreal love, while man’s love represents the worldly love that the beauty loved the hero. 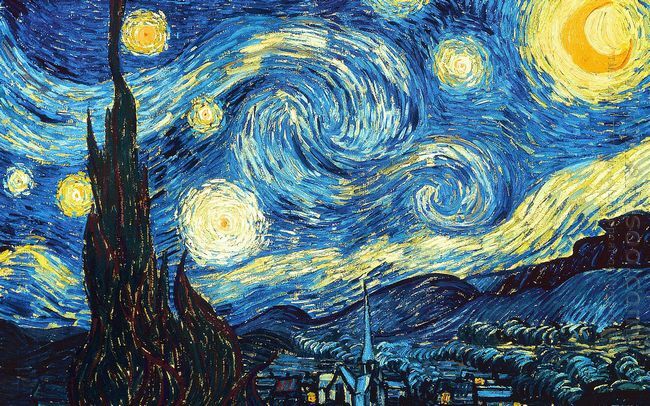 Starry Night is painted by Vincent Van Gogh in the year 1889 when he was in the mental hospital. As a representative work of Van Gogh, the post-Impressionist painter, his painting has strong brush strokes. In this painting, the main color is blue that means unhappy and sullen, while the thick brush strokes on behalf of sorrow and worry. What Starry Night portrayed is the scene that can be seen when looked out of the window, the cypress painted like black flames straight on the clouds, expressed a feeling of unease. The lines of the sky seem like Whirlpool Galaxy with stars, while the moon appeared in the form of eclipse. In the whole picture, the bottom of the village was drawing by flat and stubby line that shows a kind of halcyon, which made a strong contrast with the stubby and crooked lines in the upper part. All the highly exaggerated deformation and strong visual contrast reflects the artist’s restless emotions and psychedelic imagery world. Starry Night is a landscape painting, under the spire of the church set a village, and the stars flowed as vortex. What Van Gogh painted was his imagination, because that’s exactly what he saw. His brush stroke was bold and unrestrained, which seems to be irrational, but it doesn’t matter if it is serious or not, maybe at that time, he just closed his eyes, tasted his painfulness and followed his inclinations of squandering intuitively. 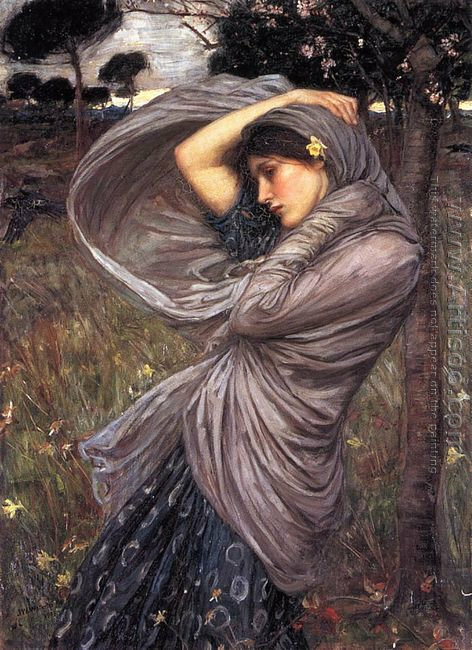 John William Waterhouse was an English painter. His artworks were known for their depictions of women from both ancient Greek mythology and Arthurian legend. Boreas was the purple-winged god of the north wind, one of the four directional Anemoi (wind-gods). Wind cannot be seen, however, the girl’s waving clothes and trees tell us that it is a windy day. As mentioned above, the scenery can strengthen the emotion in this figure painting, the same with the wind. In the painting, wind is an important feature. The girl’s sad feelings are strengthened by the depiction of wind. 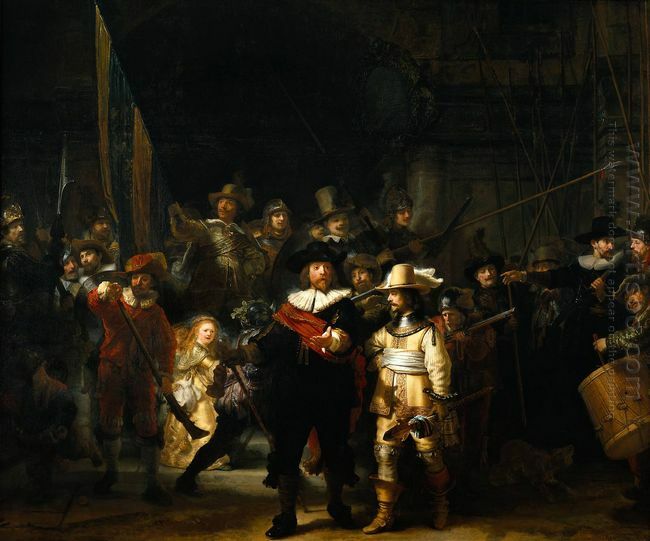 The whole life of Rembrandt Van Rijin, he painted more than 500 famous artworks. His works are closely associated with his life’s experience. bought his paintings. As a result, he could not make ends meet. For him, he had the same situation with Danae. He didn’t know how to change the situation. He was also looking forward to changing. This great job shows his mood and situation at that time.